Inc., KeyCorp and other large banks that have said in recent days that they won’t impose monthly fees on debit cards. None of those banks said they made their decisions because of the outcry over Bank of America’s fees. Well, of course they didn’t say it. But I think we can all take a pretty good guess that Bank of America’s PR debacle had something to do with it. 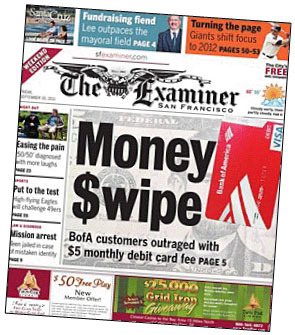 BofA imposed its monthly debit card charge to make up for lower interchange fees mandated by Dodd-Frank, and that’s why other banks have been considering it too. But as far as I’m concerned, banks could have avoided this mess completely simply by allowing merchants to pass along interchange fees to their customers if they wanted to. That is, allow merchants to post a sign saying “2% surcharge on all debit card purchases” and see what happens. If merchants try it, but competition eventually forces them all to stop, that’s a convincing signal that interchange fees are a reasonable cost of business for having a reliable, risk-free payment system. If not, then not. But banks resolutely refused to allow this, which suggests very strongly that they knew perfectly well their fees were out of line and would get passed along to consumers in a free market. And having those fees passed along would have caused consumers to use their cards a lot less. So the last thing they wanted was transparent fees subject to normal market forces. I don’t know how this is all going to turn out. It’s possible, of course, that banks will eventually figure out some other hidden or semi-hidden fee structure to replace the interchange fees. Obviously they’re going to try to make up their lost interchange fee revenue somewhere. But my hope is that as long as they’re forced to make it up with transparent fees of some kind, consumers will have a chance to react normally to those charges and market forces will then have a chance to exert some discipline on the banks — as they’re doing now with the monthly debit card fee. This will keep fees as low as possible and consumers will benefit. We’ll see.